I finally got GIStemp source code loaded into the Qemu SPARC emulator, unpacked it, and did a preliminary assessment. Next up, in looking at the things that did change, I noticed some things. First off, it points to a link for the Antarctic data that no longer works. Did it work in 2011? Who knows. But now it has a nice glitzy interactive web site that lets you download bits and pieces and look at bits and pieces… but not grab the data sets that are used as input to GIStemp. This means that either they have a very different way of getting the Antarctic data, or they just don’t bother to use it any more. Except that site now has a user friendly interface, not somewhere that you can download the data as a file. 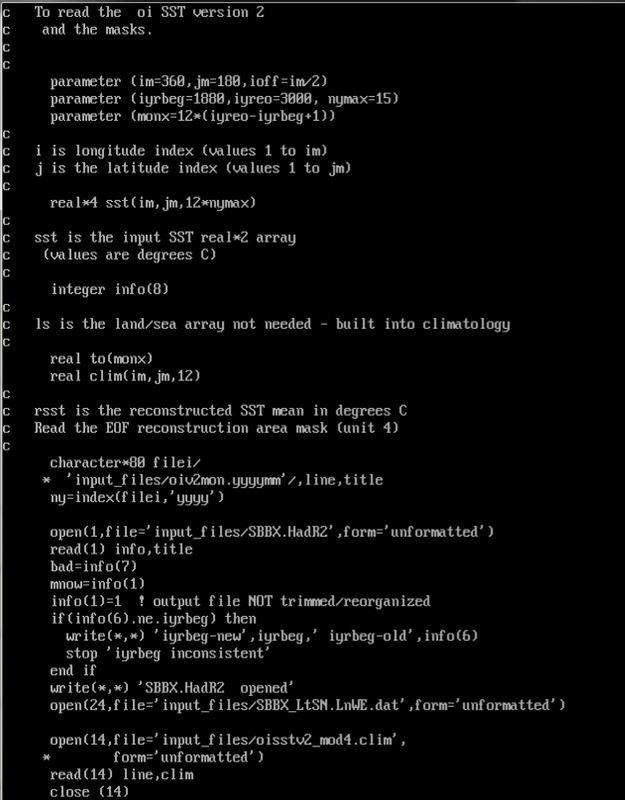 So… just what Antarctic data ARE used by GIStemp? Data, we don’t need no stieenking data! (A reference to a movie with the line “Badges? Badges! We don’t need no steenking badges!” give by some Mexican banditos pretending to be Federal agents.) Now this isn’t as bad as it looks ( or maybe it is worse…) since most of those stations don’t have any modern data anyway. Click on a few. Couple of decades for many. Often from disjoint moments in time. So again: Just what Antarctic data are used in GIStemp? Say, from this millennium? 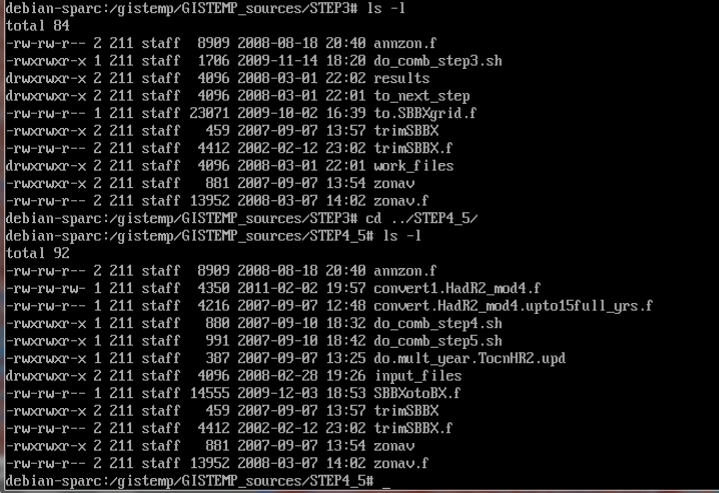 A screen capture of the listing of the input_files directory where the Antarctic data is bundled in with GIStemp sources is somewhat revealing. Notice that the Antarctic data included in the download are from ‘about’ the same vintage as the source code. 2011 is when I think they last updated. Some of the antarc data files are 2011, some 2010, some 2009… though the 2009 is marked ‘old’. So when did the Antarctic site break the download? Has there been any update since? Does GIStemp even use any Antarctic data anymore? Who knows. Since GIStemp smears data via ‘homogenizing’ to places where it has no data, from places where it does have data, and since those places can be up to 1200 km away (though it does this smear in three different steps, so really might be ‘smearing a smear’ from up to 3600 km away) it can just fill in the temp data using ‘nearby’ stations. In the final steps GIStemp adds in the Hadley Sea Surface Temperature. So what is wrong with using cold temps from near the ice to fill in over the ice? Well… How about if you decide to just not use temperatures from places where the water is near the ice? In looking at the date stamps in STEP4_5, I noticed that it had changed. Why? I wondered. It isn’t a USHCN related step, and doesn’t depend on USHCN.V1 vs V2 changes (like the rest of the changed files). Notice that this program is the only one with a 2011 date stamp. Everything else is quite old. So what changed? First off, to get oriented, let’s look at this part from the top of the code. (I downloaded this copy of the sources today, so this is as ‘fresh’ as it gets). In particular, we are looking for the meaning of three variables that are used in a very small fragment of code that was inserted into this program in 2011. They are I, J, and M. Look at the comments about lines 9, 10. They state that I is longitude and J is latitude. (You can also see where they are dimensioned and I gets 1-360 while J gets 1-180 – so 360 degrees of longitude and from -90 to +90 mapped onto 1 to 180). M gets the temperature for that location for any given month. Why focus on those variables? Because this code was added. It says to mark any cell that is anywhere in longitude ( from 1 to 360 degrees around the globe ) that are in the range near the pole, with ‘bad’, meaning to toss out the data. Just don’t use it. Notice the comment. That 166 to 180 loop says that anything from 76 N to 90 N is to have the data tossed out. I found a description of which way the arrays run. I’d assumed N to S, but they run S to N, so the above line has been changed from 76 S to 76 N. So it is the N. Pole (where there is more water data anyway) that has the SST data tossed. the other boxes (but North and South pole boxes having the same size). if dlat=180./(JM-1), pole boxes are half boxes. Though notice that there are some selections possible. So any Arctic water temperatures can only come from places closer to the equator, and the Antarctic itself has very few currently reporting stations; and that data may or may not actually be making it into GIStemp. This is the May to October period, so when it is cold at the South Pole. BTW, I have a series of sea surface graphs from that period, all showing cold water anomalies. Nowhere to be seen in GIStemp. But that is for another day to sort out. IMHO, this image is showing GISTemp having a Jump The Shark moment. This entry was posted in AGW and GIStemp Issues, GISStemp Technical and Source Code and tagged Antarctica, FORTRAN, GIStemp, Global Warming, source code. Bookmark the permalink. 33 Responses to GIStemp – who needs Antarctic data or temps near ice. The moment government took over science , science you can trust in stopped to exist. Government only needs science to gain more power to control population with fear. Only those get funding who tell the population that you need more (big) government. What a find, they just don’t care do they. 2013 anomaly vs 1951 – 1980 ? Were we not in a cooling trend those days ? Several others have been poking around and have found similar shenanigans. The “steenk” is just getting worse. Having worked for a data/analytics company, the data collection, handling and archiving looks distinctly amateurish at best. It would never pass any sort of audit in the real world, and based on that quality assessment, it would gain ZERO customers. Since the data sets which do include Arctic temperatures say that the Arctic is getting warmer, perhaps leaving out the sea containing Arctic ice floes is why GISTEMP shows a lower temperature than the others. You’ve read this one, haven’t you? E.M. thanks for the heads-up. Wow, GISS, what are they playing at, certainly they never thought they would be exposed. GISS = Guessed Input Sample Synthesizer ? As Charlie Brown said, “Good Grief!”. Now you put it in front of us, it’s as obvious as Basic 101, whether you speak the language or not. It’s certainly one heck of an Easter egg for those of an AGW disposition. Makes you wonder just how many more of these little logic bombs are out there, tucked away in climate data sources and models alike. Now I know why the “scientific consensus” is saying that the icecaps at the poles are melting (and fast! ), with all that heat of GIStemp charts that’s exactly what *would be* happening… if it was true. But, we all know that neither the heat nor the melting are happening. As you said Chiefio, the oceans around Antarctica have been cooling since (at least) 2011, meaning *negative anomalies*, not the red hot ones shown in GIStemp. To have the real trend, as shown by other sources, you’d have to replace the “white” and “yellow” regions by “blue” and “dark blue”. 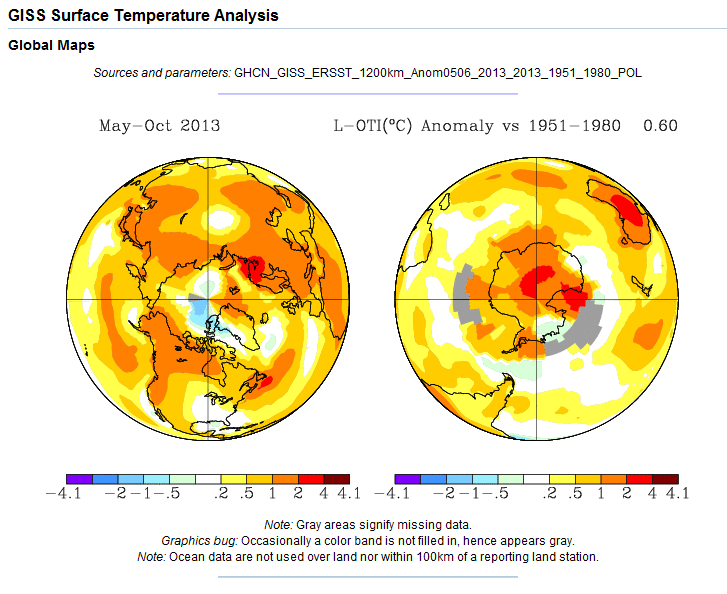 I also have a series of charts from UNISYS showing the cooling trend in the SST of the S. Pole. We already knew that GIStemp was wrong, now we know why. A scoop: The french Antarctic scientific station Dumont-d’Urville just recorded the june 2014 month as the coldest month ever since the station was established in 1956. The silliest situation is how NASA’s main climate office ignores NASA satellite data except to estimate urban heating via nightime illumination. Might they estimate urban heating with satellite *temperature* data instead?! It would really worry them that actual satellite temperature plots are maintained by outspoken climate alarm skeptics, were the GISS guys not clear sociopaths. Now the alarmist team has started citing amateur hour Cowtan & Way’s similar use of satellite data to smear ground data out onto the Arctic to turn the recent lull into a new peak in a way that the satellite data itself simply falsifies. What’s most frustrating is the straight faced seriousness with which they present this crap to the media and to policy makers. “I have no idea how one deals with this– to be candid, McIntyre or Watts in handcuffs is probably the only thing that will slow things down.” – Robert Way in the exposed secret forum of John Cook’s site. Thanks, Chiefio I’ll have to link this post the next time someone want to argue with me about GISS deleting SST data in the polar oceans. See http://data.giss.nasa.gov/gistemp/station_data/v3.mean_GISS_homogenized.txt.gz to check that the Antarctic stations are being updated to match the download sources. The GISS source download does not get updated monthly to match the latest data uses, although a mirror, as once existed, would be useful, and an archive too, as also once existed. The source is updated when code changes, not data. I’ve verified STEP0 through STEP2 for v3 against my own implementation by comparing v3.mean_GISS_homogenized.txt with my own implementation. Minor discrepancies due to platform dependent rounding to 0.1C only. I went to where they had always put the sources. There. OK… starting from: http://data.giss.nasa.gov/gistemp/ doesn’t say where to get sources… but clicking on lots of stuff eventually finds that “current analysis” links to the v3 stuff. http://data.giss.nasa.gov/gistemp/sources_v3/gistemp.html as a descriptive page… but not the actual sources. Is there some simple way to find out that sources_v3 exists? So both are up, eh? I presume you got to the v3 stuff from some indirect navigation from their top page? I’ll go get the new stuff and diff it as well, then. If, in the new code, they have directions to some new Antarctic data source, that would be nice to know. It isn’t available as a file download at the prior links. The real ‘surprise’ to me is that the v3 source code looks like it is only linked from the GIStemp page in a link that says ‘current analysis’ rather than ‘v3 source code’. Not exactly misleading, but not very clear either. Especially when a reasonable google search turns up the old ‘sources’ link and it says nothing about being ‘old’. So, OK, it’s not horrible; but it is still not very cleanly done. Does this mean for all seasons, including the SH summer? Could this be in a large part why GISS diverges from RSS so much of late? oops “76 N to 90 N” I guess I meant the N.H. summer. Wait, the post is about the S.H. Does this apply to both? Comments or corrections to the preprint would be appreciated. It would be nice to have a tidy download bundle, but that is not within GISS control. It’s quite a while since I worked through the GISS program code and scripts doing my own implementation in C# rather than FORTRAN, Python and shell scripts. But it was all there. You do need to look at the scripts as well as the FORTRAN/Python as I recall. – In 2011 Gistemp was reporting a warming rate for 1998-2010 unchanged from the rate of 1976-1998. In 2014 Gistemp reports the rate halved. – In 2011 Gistemp was reporting a warming rate for 1976-2010 was 2.2 times the rate of the early twentieth century warming. In 2014 Gistemp reports just 1.2 times. 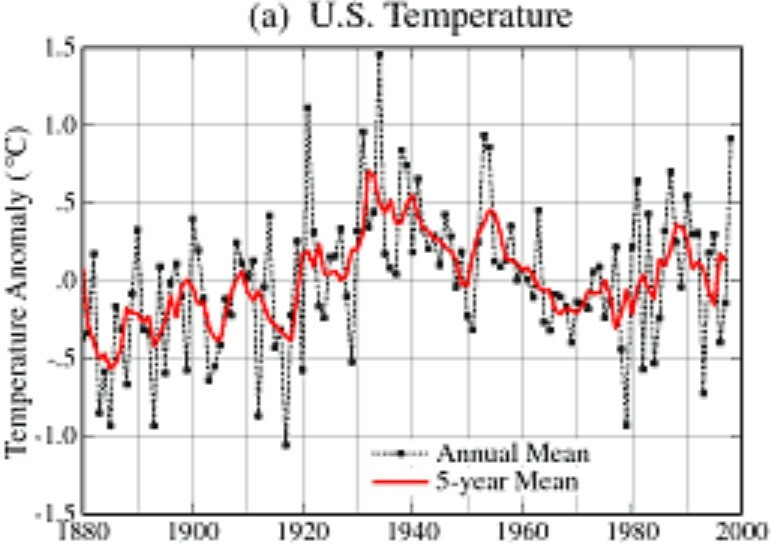 Early C20th warming has increased from 0.33 to 0.53 degrees. What is most significant is that Gistemp has come into line with HADCRUT. For instance in 2011 Gistemp was saying the peak of the early C20th warming was 1940. HADCRUT3 reported 1944 as the warmest year. Now both Gistemp and HADCRUT4 agree on 1944 as the peak year. Then, even if more recent data is found, the title is accurate, is it not? This data does not come from GISS, so they can hardly order that it be made available in a different format. At most they might make available the intermediate files from their monthly Gistemp run, as indeed they once did, possibly unintentionally. This would include the Antarctic data, but only for a single date each month. Anyone requiring the data at any other date in the month would still need to go to the original source. Did E.M. Smith also receive an invitation to dinner with Obama? It is a blanket operation, no limitation based on any other variable (date, time, whatever…); so yes, it is just excluding the water temps ‘up there’. The post is about GISTemp, both poles. The original question was antarctic temps and temps ‘near ice’, with a bit of confusion over ‘which ice’. It has been clarified to “antarctic temperature data and north polar ice”. In the graph you have Xe1 and Xe2, in the text you talk of ‘strange’ Xenon. It might be nice to state that “strange Xenon is of mass (foo)” in the text. I think it is the Xe2 that is higher in both 124 and 136 and not the Xe1 that is 130, but that’s based on one caption and you made me ‘work at it’… which some folks will not do. Might be easier to include a definition along the lines of “Xe1 is mostly isotope 130 and found on earth, while Xe2 is a bit ‘strange’, found in space, and is mostly isotopes 124 and 136” or whatever is correct…. You use the term “s-products”, but I’ve not found a definition of it yet. Maybe I just missed it? Similarly p-process and r-process. Perhaps all that is clear to the intended audience, but to me it’s a bit un-clear.